Amanda Kerri can't quite wrap her head around Sam Smith's nonbinary, genderqueer identity, but she's trying. You should too. There are a lot of transgender people out there that have strong assertions of their gender identity. They just know that they are not the gender they were assigned at birth based on the bits that dangled or not between their legs. With an incredible certainty they know and feel it their whole lives, and the pain of being forced to live a life they feel is forced upon them by society so greatly drives them to all sorts of measures to escape this torture. These feelings start as early as they can remember, and it shapes their whole lives. Some do not. Some wrestle with a conflict they can’t describe or even understand fully. For years they struggle with this conflict until there is a moment of understanding and they can begin the process they need to feel better. Of course, this is not like being genderqueer. 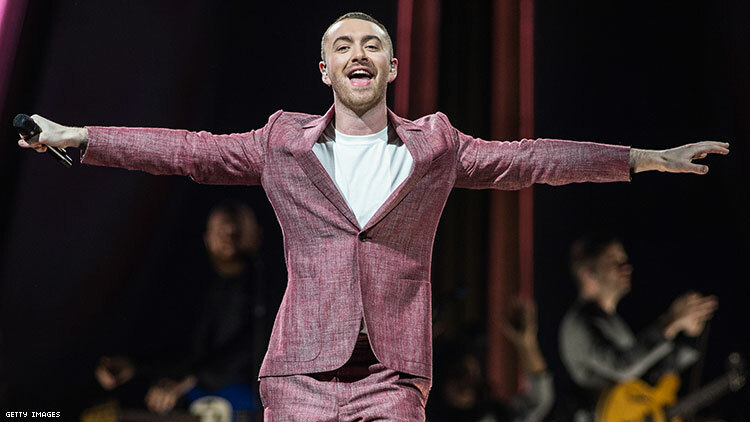 Musician Sam Smith recently came out as genderqueer, and it’s created a lot of discussion and buzz, probably since he is the most famous person to come out as such. I’ll be perfectly honest, as a transgender woman, I can’t fully wrap my head around genderqueer identity. I fully appreciate and understand what it’s like to be transgender because I’ve lived it — and cisgender is easy to understand. Yet, being genderqueer I can’t fully wrap my head around. This doesn’t mean I don’t respect or believe them. That doesn’t mean that I won’t fight for their recognition, and I won’t defend them when made they're subject of a joke or attacked. I just don’t fully get the idea of feeling a mix of male and female or neither. Smith described himself as both nonbinary and genderqueer, and that just throws me. I mentioned earlier how there are transgender people incredibly certain of their identity and some who are not. I’m one of those transgender people that took until I was in my mid-20s before I fully began to wrap my head around who I was. If you had to quiz me about that one magic moment of realization, I couldn’t point to one. To this day, I can’t quite tell you what makes me feel this way; it just feels right. That’s one of the hardest things for people who don’t understand what being transgender is all about; that for us, there is just this feeling that this fits for us. It’s probably one of the hardest things for us to overcome when fighting for our rights and acceptance. That’s why transgender people want to focus so much on the science of who we are, which to be perfectly honest, is still not completely understood. Is it something genetic; something in the structure of our brain? The only thing modern medical science can tell us with any certainty is that the only real way to treat us is to let us transition, since trying to force us to conform to those bits that dangle or not almost universally results in psychological torture for us. So when Smith came out as genderqueer and described how he felt in such nebulous and abstract terms, I knew how he felt. You can’t fully explain this feeling in words with any hard certainty because it’s so esoteric. The words almost seem flippant and cheesy, like mediocre feel-good quotes you find on a kitten-hanging-from-a-tree poster. It’s not quite right for me to talk about what it’s like to be genderqueer because I’m not, but because I’m one of those types of transgender people who for years wrestled with my identity, trying to understand my feelings. I understand that emotional ambiguity and that complexity of identity. Transgender people introduced the idea that gender is a spectrum and largely a social construct and the science of gender is a constantly changing landscape. However, scientists do know that the way men and women process the world around us is different; everything from emotional expression, learning styles, memory recall, aggression, and the way we understand scientific information. No one way is arguably better than the other, but why they are different is still hotly debated and constantly studied. There are a lot of straight cisgender women MMA fighters, hate the color pink, and don’t have a nurturing bone in their body, and there are straight cisgender men who cry during “chick flicks,” lack any sort of aggressiveness, and make a living as make-up artists. There are trans women who want to be soldiers; trans men who want to be nurses. Gender expression and roles are a crazy wild spectrum. Some genderqueer folks describe themselves as feeling female one day and male another and I get that — that's how I felt at times before my transition, but I don’t get how they can’t feel being one or the other, both, or neither for their entire lives. This is all on me, not on folks like Sam or the uncounted nonbinary folks out there. When I see the glazed over look on people’s faces when I try to express my gender identity I know the frustrations genderqueer probably feel when it doesn’t process. However, if my own group argues that gender is a spectrum, then who’s to say that genderqueer isn’t a fourth, fifth of even 16th gender? We’re in a period where close to 2,000 years of cultural concepts of gender and sexuality are changing, and that frustrating thing that is our brain is barely understood, but we’re discovering new things about it all the time that change the way we understand humanity. In the end, all folks like me who don’t quite get it just need to know this is how others feel and use what pronouns they prefer. It’s just about respect.